A 64-year-old female presented with the bilateral swelling of the legs. She had a history of high blood pressure seven months ago. At the time of the hypertension diagnosis serum creatinine was 1.1 mg/dl. The physical examination was unremarkable. Urinalysis showed 3+ red blood cells and 3+ protein. The amount of proteinuria was 7 g/day, serum creatinine at the time of admission was 2.7 mg/dl showing a progressive increase to 5.4 mg/dl over the next 1 week, serum albumin level was 2.1 g/dl, serum C3 was 0.9 g/L, and C4 was 0.3 g/L. Renal biopsy performed yielded cortex containing 10 glomeruli for light microscopy, of which 3 were globally sclerotic and the remaining 7 glomeruli had fibrous to fibrocellular crescents in all. No necrotic lesion was found. Capillary membranes were thickened with subepithelial spikes [Figure 1]. Direct immunofluorescence tests showed IgG, C3, and both kappa and lambda light chains granular deposits along the capillary walls. Immunostaining for anti-phospholipase A2 receptor (PLA2R) antibody was not performed. The histological diagnosis was crescentic glomerulonephritis (CGN) in association with membranous nephropathy (MN) stage II. Antibody profile was negative for anti-double-stranded DNA, anti-neutrophil cytoplasmic antibody (ANCA), anti-glomerular basement membrane antibodies (anti-GBM), and PLA2R. Serology for hepatitis B and anti-hepatitis C virus antibody was negative. After evaluation for a secondary MN by chest abdominal computed tomography, colonoscopy, and duodenoscopy we found no evidence of cancer. Treatment was initiated with 1 g of methylprednisolone intravenously daily for 3 days followed by prednisone per os daily 1 mg/kg/day for 1 month which was tapered down till discontinuation after 3 months. We also prescribed 1 g of intravenous cyclophosphamide (IVC). The patient was discharged 22 days after her admission, with creatinine level of 2.8 mg/dl. Five more monthly IVC doses were programmed. After 1 year follow-up, the patient referred no symptoms, her serum creatinine was 1.7 mg/dl, the 24 h urine protein was 1.5 g, urine sediment had no erythrocytes or casts, and ANCA was negative. In the absence of lupus nephritis, anti-GBM nephritis or ANCA positive vasculitis, MN, and CGN is an unusual association. In the best of our knowledge, there are 30 cases reported in the literature of concurrent MN, CGN, and negative ANCA serology [Table 1]. The largest series was reported by Rodriguez et al., in this none of the patients had extrarenal manifestation of vasculitis. This case may represent either an entity of MN with crescents or an MN with superimposed secondary ANCA-negative CGN. ANCA-negative CGN tends to show necrotizing lesions in a context of systemic disease. In our case, the absence of necrotizing lesions in biopsy specimens and lack of extrarenal symptoms argue suggest that it could be a single distinct entity MN. Moreover, it is not confirmed that our case is a primary MN, despite the negative screening for a secondary MN, in this context PLA2R immunostaining could be helpful. In all cases, the clinical course of this patient is serious and an immunosuppression is essential in order to avoid end-stage renal disease. Nasr SH, Said SM, Valeri AM, Stokes MB, Masani NN, D'Agati VD, et al. Membranous glomerulonephritis with ANCA-associated necrotizing and crescentic glomerulonephritis. Clin J Am Soc Nephrol 2009;4:299-308. Balafa O, Kalaitzidis R, Liapis G, Xiromeriti S, Zarzoulas F, Baltatzis G, et al. 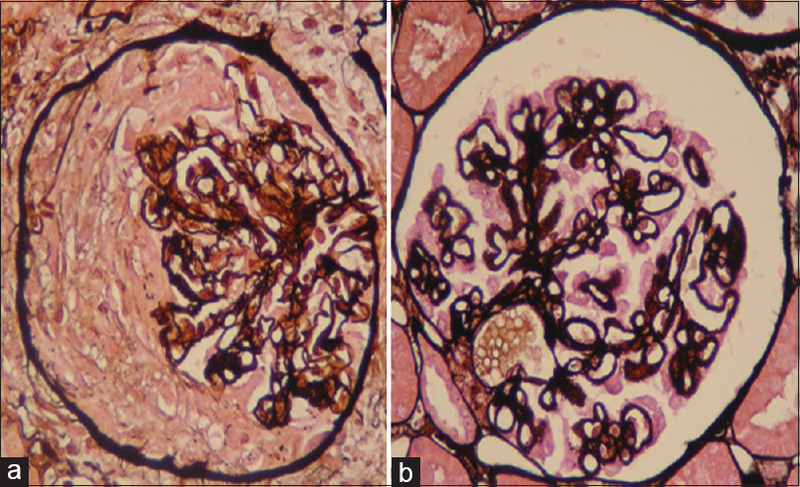 Crescentic glomerulonephritis and membranous nephropathy: A rare coexistence. Int Urol Nephrol 2015;47:1373-7. Rodriguez EF, Nasr SH, Larsen CP, Sethi S, Fidler ME, Cornell LD, et al. Membranous nephropathy with crescents: A series of 19 cases. Am J Kidney Dis 2014;64:66-73.